The beach at Cala Santanyí is crowded by tourists in the months of July and August usually. To avoid the hustle and bustle of tourists, it is better to come in the low season (May to June or September). Want to take a swim in the ocean or to sunbath at the beach? Traveling to Mallorca in May/June or September is perfect because it is in the low season (cheap! ), plus the water and air is still warm enough for swimsuits. 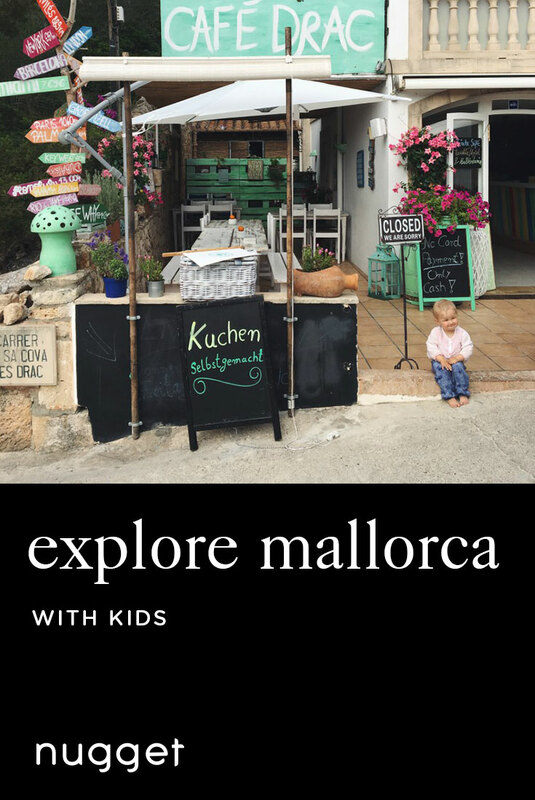 Visiting Mallorca with kids? This is the perfect itinerary for any outdoor loving family. Soak some sun on the lovely Cala Santanyì Beach, and treat yourself to ice cream and delicious snacks while overlooking the bay at Café Drac. Take a short walk and be amazed by Es Pontàs, a gigantic natural arch where you might spot some brave climbers in search for an adrenaline rush. Then drive to the rural city of Ses Salines, a village rich in history and one of the most authentic places in Mallorca (Majorca), to stroll around the shops before dinnertime. Round off your day with homemade traditional food with a modern edge in a gem of a restaurant at Cassai Gran Café & Restaurant. Its rustic, chic interior and easy-going, Mediterranean ambience will be a crowd pleaser to parents and kids alike. This family-friendly, sandy beach is located in a small, protected bay. The beach is about 100 m (328 ft) long and 70 m (230 ft) broad. Cala Santanyí Beach has lovely fine sand - making it ideal for small kids - with rocky cliffs and pine trees. You can also rent some umbrellas or chairs here, if you want. Nearby you will find two stylish bars/restaurants, as well as showers and toilets. Besides this beach being so perfect for families with kids, this beach is hiding some surprises. Walk along a small path on the cliffs where you will find small, picturesque boat houses with painted shutters. This place felt so original and quiet compared to the more busier beach in the area. Cala Santanyì Beach is a real place of calm. DIRECTIONS Cala Santanyì Beach is located around 6 km (3.7 miles) from the lovely rural village of Santanyi. There is limited free car parking next to the beach, or you can park in the village streets nearby. TIP There is limited free car parking next to the beach. During the summer, the parking spaces are quickly occupied. You might have to park alongside the road just next to the parking instead. This charming bar offers a splendid view over the ocean and the bay of Cala Santanyí. The bar offers just a handful of tables outside, which makes it really cozy. You can taste homemade tapas, traditional Spanish food, fresh fish, drinks and cocktails here. Café Drac offers a very casual, uncomplicated vibe that we liked a lot, because we just came from the beach to refresh and to have some drinks. It is really picturesque and fits perfectly into the small bay. Es Pontàs is a natural arch and it's not only visited by tourists but also from climbers around the world: Es Pontàs is also famous solo water climb of Mallorca. With calm seas you can even pass under the arch with a paddle boat. The view is magnificent and even more romantic with the sunset behind the arch. We found it very convenient that this natural wonder is located in walking distance from the beach at Cala Santanyí. This made our beach day even more interesting and added definitely a highlight to our day. DIRECTIONS You can reach Es Pontàs from Cala Santanyí Beach by walking. Follow a small street on the right side of the beach. You will pass some hotels and holiday accommodations and after about 300 meters (0.2 miles) you will reach the unpaved path that leads to the arch. TIP To visit Es Pontàs, you should bring a baby carrier instead of a stroller. The unpaved road to the arch is rocky and includes a few steps. Be careful when you reach the cliffs! There is a visitor area with a fence; however, that fence isn't very long. Keep a close eye and don’t let your children wander too close to the edge! Cassai Gran Café & Restaurant is located in the heart of Ses Salines, a small town with the atmosphere of authentic, rural Mallorca. The Cassai Gran Café & Restaurant itself is in a really old Majorcan house, with stone walls and a traditional, rustic-style courtyard that is decorated with plants native to the island. We were blown away by the beauty of this cozy restaurant and its homemade pasta. The restaurant’s mediterranean fusion cuisine is delightful. Our nugget couldn't tear her eyes away from the balls of white cotton and many other plants that were hanging from the ceiling. The fancy bar is also a stunner! The Cassai Gran offers high chairs and different menus for kids. It is a perfect place to hang out, no matter if you want to have lunch, dinner or just a drink at the bar. The city as well as the restaurant will embrace you with pure mediterranean feeling! DIRECTIONS From Cala Santanyí Beach, take the road A-6102 for about 3 km (1.9 miles) to Santanyí. From there, take the road Ma-6100 southward for about 6 km (3.7 miles). You will pass the village Es Llombards on the road as you make your way to Cassai Gran Café & Restaurant. The restaurant is located on Main Street of the village of Ses Salines, and on the opposite side of Cassai Home & Fashion. TIP The Cassai Gran Café Restaurant is well known. Reserve a table in advance if you plan to have dinner. The city of Ses Salines and the cute shops are worth a visit too. Take some time to stroll around before or after lunch or dinner.